At this moment I am the biggest star in the country. I have gone from here in California to the tip of New York. I am invited to parties with all the great stars of Hollywood with beautiful girls. I am the toast of the city here in Hollywood, as well as in New York, people ask me for autographs, kiddies from five years old adore me to teenagers as well as adults and college groups. Tiny was not delusional. By July 1968, Tiny-mania had reached a fever pitch. 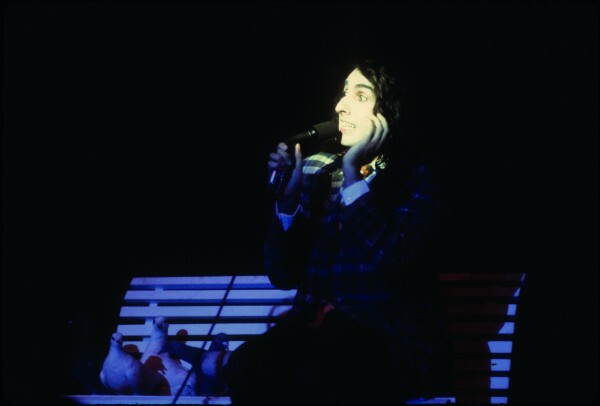 On June 29, the day after his performance at the Santa Monica Civic Auditorium, God Bless Tiny Tim moved up to number 16 on the Billboard charts, while ‘Tip-Toe Thru’ The Tulips’ peaked at number 17. Though Tiny had in mind a number 1 single, breaching the Top 20 was a massive accomplishment. As the album spread across the continent, Tiny began touring the US, performing everywhere from Phoenix, Arizona, to Hampton Beach, New Hampshire. In Detroit, he was mobbed by teenage girls during a performance at the Edgewater Amusement Park. Delighted, he ripped off his tie and threw it into the crowd, which excited them further. Caught up in the moment, he began ripping the buttons off his vest and threw those, along with some love beads, into the crowd. The crowd responded by throwing beads back at him. As God Bless and ‘Tip-Toe’ slowly descended from their peak positions, Warner Bros decided it was time to issue a second single. Instead of issuing another single from Tiny’s first album, the label issued a recording of a 1924 number originally recorded in the blackface/mammy style, ‘Bring Back Those Rockabye Baby Days.’ The choice was a bizarre one—probably Tiny’s, since he later recalled showing ‘them’ the song. Furthermore, Reprise had produced ten-inch acetates of a planned ‘Then I’d Be Satisfied With Life’/‘Strawberry Tea’ single, but for reasons unknown the release was scrapped. One reviewer later called ‘Bring Back Those Rockabye Baby Days’ a ‘paranoid retreat into baritone.’ Perhaps its release was an attempt to save Tiny from being pigeonholed as a falsetto singer. The finished product—even with ‘This is All I Ask’ as the B-side—just did not pack the punch of ‘Tip-Toe.’ Something was missing, and Tiny knew it. He later blamed his disappointment with the single on the lack of ‘an engineer who understands the different eras,’ and on himself, for not being in great voice, likening his vocals to ‘an orange half squeezed.’ He once even called the song ‘simply horrible.’ Nevertheless, he was obliged to promote the record before its July 17 release. ‘What do you mean, for them?’ Carson asked. Shortly thereafter, Wachter visited Tiny at the Sunset Marquis Hotel. Despite Tiny’s busy schedule, the two found a few minutes to relive the old days and played an improvised game of hockey with a puck and stick Tiny had in his room, using a coffee can for a goal. ‘That’s my pay,’ Tiny replied. Wachter did not press the issue. The truth was, whether his earnings were small or large, Tiny was always kept in the dark about the financial aspects of his own career. A few years earlier, he had allowed the likes of Bud Friar and George King to take exorbitant shares of his meager earnings in order to keep playing the small clubs and dive bars. Now, with more on the line, a docile Tiny dared not shake the boat. He later claimed that the first time his management spoke to him of his finances was only to tell him that they would not disclose his earnings from the Santa Monica Civic Auditorium as it would ‘shock’ him. Furthermore, he claimed later that he only learned of his $50,000 income from the week-long engagement at Caesar’s Palace in the trade papers. On June 3 1969, Victoria Budinger awoke to her mother’s voice. ‘Wake up! Come on! We’re going to Wanamaker’s today!’ The seventeen-year-old groggily obliged. The Budingers were a middle-class family living in Haddonfield, New Jersey: Vicki’s father, Alan, was a traveling art-supply salesman and sometimes artist whose work had required the family to relocate frequently, and Vicki, the second youngest of five sisters, had recently dropped out of school due to complications brought on by the family’s repeated moves and had taken a job as an usherette. Her three older sisters had already moved out of the house; her younger sister was still in elementary school. Vicki and her mother took the train to the Wanamaker’s in Philadelphia. By noon, they had made their way to the fifth floor, where they inadvertently walked into a Tiny Tim Beautiful Thoughts book signing. Vicki had first seen Tiny on television the previous year. Though her parents usually watched Bonanza, one evening they caught Tiny’s segment on Laugh-In. Vicki was intrigued. ‘I thought he was really interesting and different,’ she later recalled. 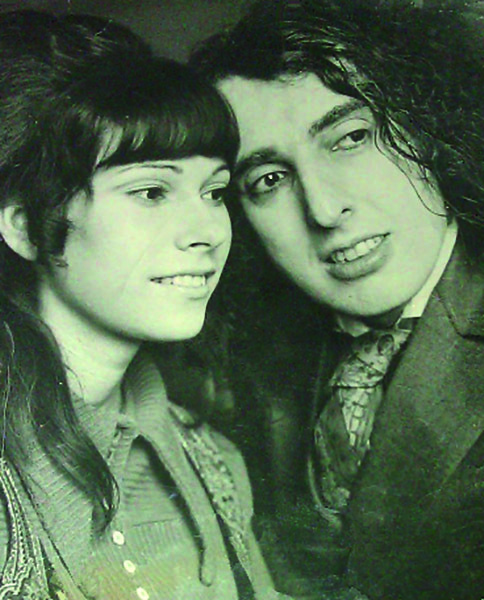 ‘There was something about him that made me want to hear and see more.’ She bought a copy of God Bless Tiny Tim and watched his subsequent TV appearances. After singing ‘Tip-Toe,’ Tiny sat down for the autograph session. Vicki made her way along the line, and when she arrived, he looked at her for a long moment. Tall and slender in a silver-gray dress, with shoulder-length brown, wavy hair, clear brown eyes, and an innocent, unassuming disposition, she must have stood out to her thirty-seven-year-old admirer. She handed Tiny a book to sign. ‘What’s your name?’ Tiny asked, pen in hand. Vicki noticed a Band-Aid on Tiny’s hand and asked about it. ‘It’s for removing warts,’ Tiny blurted out. Despite his cringe-worthy response—about which Motion Picture magazine would later sardonically comment, ‘You just don’t hardly find these romantic moments anymore’—Vicki then came back along the line again with a second copy of Beautiful Thoughts. Again Tiny signed her book, but he failed to give her an address or phone number. The local reporter kept his promise, and the next morning the paper carried a headline asking, ‘Who Is The Mysterious Miss Vicki?’ The article included Tiny’s description of Vicki and how he felt about her, and urged the mysterious girl to come forward. Back in Haddonfield, Vicki’s mother saw the article. ‘I think that’s you!’ she told her. Meanwhile, Tiny left Philadelphia for a television appearance in New York. He returned four days later, on June 7, for another series of book signings. When Vicki’s mother read of his return, she urged her daughter to go along to the book signing. ‘Go and see if that was you he was talking about,’ she said. Vicki and her sister Tracy duly arrived at the signing, and Tiny was ecstatic. She passed along her address and promised to come to his next appearance that day. Afterward, Tiny hurried back to his hotel room and ordered a trophy over the phone. ‘Look, I met this beautiful girl named Miss Vicki,’ he said frantically, ‘and I’ve got to have a trophy today!’ Normally, Tiny’s trophy ritual took place at the end of the year, but Miss Vicki had moved him in such a way that, for the first time, Tiny gave a trophy in the middle of the year. The store had a trophy delivered to Tiny’s hotel by 1pm. It was three-and-a-half-feet tall and topped with a golden angel, arms stretched to the heavens.